In my last post, I described a Cristophe Hair Product deal- here's how I made $8 overage! 1- Johnson Buddy ($.99) used $1/1 coupon = FREE! 1- CVS brand foaming hand soap ($1.99) - used $2 off CVS skincare product coupon = FREE! 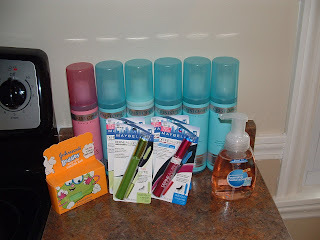 Used $2 off any CVS Brand Purchase (Cristophe) -- this evens out the Maybelline! Recieved $10 back in ECB! random question......when you used the $5 off cristophe coupons that were stuck to the bottles, did they beep at all or go through fine? they're not technically for the shampoo/conditioner but i was wondering if they worked smoothly or had to be manually put through. You know, I don't think they beeped at all. I'm pretty sure they went through ! (Which would be a first right ? ;) ) The stickers that were on them said any hair product or whatever.